Mrs. Myra I. Rodgers, age 100, formerly of South Loop Road, Steamburg, NY died Friday afternoon, May 8, 2015 at the Absolut Nursing Care in Salamanca, NY following a long illness. Born November 17, 1914 in Elko, NY, she was the daughter of the late Floyd Johnson and Alice Pierce. 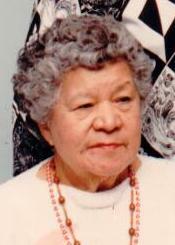 Mrs. Rodgers was an enrolled member of the Seneca Nation of Indians and the Hawk Clan. She was employed with the Seneca Nation’s Nutrition Department, the Bradford Regional Hospital in Bradford, PA and the former Fairmont Ice Cream Company in Quaker Bridge. She was an avid bingo player and will be remembered for her Sunday morning breakfasts that she cooked. Surviving are: a daughter-in-law, Laura Rodgers, Randolph, NY; a niece, Virginia Strasser, Steamburg, NY; 8 grandchildren, Bruce (Penny) Johnson, Ellington, NY, Darlene Kiendl, Kennedy, NY, Sue (James) Cawley, Bradford, PA, Gary (Janet) Johnson, Jamestown, NY, David Johnson and Ronald Johnson, both of Salamanca, NY, Lori Johnson, Kennedy, NY, Russ (Lila) Geiser, Kenmore NY; 23 great-grandchildren, 30 great-great-grandchildren; several nieces and nephews. Mrs. Rodgers was predeceased by two sons, Verona “Ron” Johnson, Rutherford “Russ” Rodgers; four sisters, Rose Bentley, Valora John, Valleta Johnson, Ramola John, and three brothers, Elmer Johnson, Karl Johnson, and Boyd Johnson. Memorial visitation will be held at the O’Rourke & O’Rourke Inc Funeral Home, 25 River St, Salamanca, NY on Thursday, May 14, 2015 from 1 – 2 pm, at which time funeral services will be held with Rev. Marvin Abrams, pastor of the Jimersontown Presbyterian Church, officiating.